When filled with Foaming Bottle Wash and pump is used, a bubbly foam is produced. Do not fill bottle passed the foamer chamber. This may prevent the pump from working properly. COMMENTS: Quality on these is amazing. No problems from clients, even those who buy refills and refill it at home. COMMENTS: Foamer top is reliable and I haven't had any failed ones yet! COMMENTS: I got these pumps to go with the foam bottles. They worked great. The design was nice. The pump fit on the bottle nice and tight. I did not have any issues on bottles leaking when i was transporting them. This is great also the turn and lock.so at a fair a child cant come over and push them down and have foam soap everywhere. Gee not that would ever happen people watch there kids so well..... Lol. Anyway i will buy these again with the bottles. I recommend them 100%. COMMENTS: I use these with the table top 8.5 oz bottles to make foaming face wash, and hand soap. They work perfectly and do not leak. They also look beautiful! COMMENTS: These foamer tops look great and make a nice foamy lather. "Perfect fit for the Amber Bottles!" COMMENTS: These fit perfectly with our 8.5 ounce Amber Bottles. Will definitely be purchasing again! COMMENTS: Great product. I just wish it came together with the soap bottle. It gets a bit pricey when you have to buy both. COMMENTS: These pumps are great for foaming hand soap. They work great, no need to trim if used with the recommended bottle. COMMENTS: These are great foamer tops!!! They never clog. Great reviews! COMMENTS: This foaming pump works great and looks great! It has a lock feature on it for travel or shipping purposes. The white is glossy and looks very sharp. I highly recommend this pump! COMMENTS: No complaints! Customers love the attractive hand pump. "40mm Table Top Foamer Pump- White"
COMMENTS: Looks just gorgeous when on the pretty table top bottle in clear with a colored soap. Please remember you need to use the foamer style liquid soap, contact WSP for details. These people are so kind, a real pleasure to have done business with. COMMENTS: Great foamer pumps! 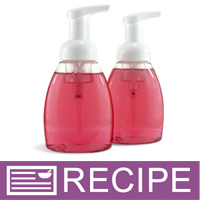 My Foaming Hand Soaps are a big seller and these work great! Look professional. COMMENTS: The foam pump only works for a few weeks before it starts to stick. No amount of cleaning helps this problem. This is very frustrating and my customers are dissapointed. I am actively looking for another bottle and pump that lasts longer then two or three weeks. • The bottle is attractive. • The pump sticks in the down postion. COMMENTS: I've been using this foamer top for about 6 years, and it's a favorite of my customers. It creates a nice, rich, foamy lather. COMMENTS: I buy both colors and love these tops! They are sturdy and well made. COMMENTS: I purchased this foamer pump top to go with the 8.5 oz Clear Table Top Bottle. Worked wonderfully for my liquid castile handsoap! I plan on purchasing another for my second bathroom. COMMENTS: This is such a nice top for the foamer soap...really classy! "Table top foaming pump top"
COMMENTS: High quality pump and awesome design. Love these! COMMENTS: I loved this pump! It worked so well! I have no qualms or anything bad to say about it. The quality seems really good too! COMMENTS: Just made a bottle of natural foaming hand wash - this pump is just as good as any of the name brands you buy in the store - love it! COMMENTS: Love these foamer pumps! I spent a lot of time trying to (unsuccessfully) thicken my liquid lye soaps for lotion pumps. Tried these and my soap is the perfect consistency for the pumps! These are thick and well constructed, they don't squeak at all when using or feel loose. My customers love them too! COMMENTS: I just added foaming hand soap to my store a few weeks ago. But with these pumps and bottles, as with all of WSPs packaging, it just sells its self. Customers are immediately drawn to these bottles and you have an instant purchase along with a request for their favorite fragrance! COMMENTS: I love this foamer. I make a liquid hand soap and could never get it thick enough. 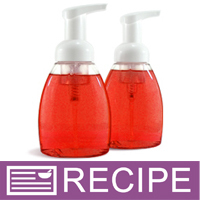 This foamer allows you to use a think product and make a nice foaming hand soap! These are great and at a great price! "The best foaming pump on the market!" COMMENTS: These foaming pumps are the best I have found. They make wonderful suds and don't squirt suds all over like some other pumps have. They also really hold up. I can count on these to last through thousands of pumps. I know this as every soap in my house and business has one of these foaming pumps. COMMENTS: This dispenses hot process liquid soap perfectly. Users love it. A bit pricey, but since it dispenses less soap, the 8.5 ounce table top bottle lasts a good long time. Therefore, an upcharge to the consumer is equitable. COMMENTS: We gave these to a few of our best customers at Christmas - labeling is a little tricky without a flat surface, but they work great. "I recently purchased the 40 oz table top foamer pump tops and am wondering if there is a secret to getting the pump lined up to be exactly in the middle of the front of the bottle. No matter what I do it always seems to be just a little off center. I think that will bug some people. I understand how the pump works, I just cannot get it to line up! Please help? Thank you! Patti Connors"
Staff Answer There is no secret to getting the pump to line up. They do not line up straight and do line up on an angle. Unfortunately, there is nothing that can be done about this. No matter where you place the pump top, it will still line up at the same place. "Can any liquid soap be used with this pump and dispense as foam, or does it have to be used with the base you sell for foaming products (hand/body/face)? Thank you." Staff Answer The Creamy Hand and Body Wash for Foamers is specially designed for these bottles. You can use a regular liquid soap but it would need to be mixed with water in order to work in the foamer top. You would need to mix 4 parts water to one part liquid soap, add the EO/FO modifier and also a preservative. "I am making liquid soaps for use in a foamer pump. I want to use as little plastic as possible. Will this or any other foamer pump work with any of your glass or stainless steel bottles?" Staff Answer These foamer pumps and bottles have been designed to be used together. We do not have any other bottles that will fit these foamer pumps. "I am having problems with the pump,I can't get it to open for use?" Staff Answer This pump top does not need to 'pop' open you just need to line it up with the grooves on the base of the top and then pump. "I'm looking to package in glass but with a foaming top. Do you have a glass bottle that would fit this foamer? " 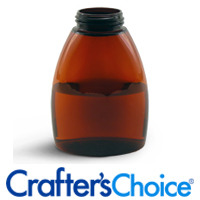 Staff Answer At this time we only offer the plastic 8.5 oz Table Top Bottle in amber or clear for this Foamer Top. "What is the best way to shorten a dip tube?" The best way to shorten a dip tube is to measure the height of your bottle and then snip the dip tube with scissors at an angle with the longest point grazing the bottom of the bottle. Click Here for an education video on properly cutting your dip tube! "I added castile soap to these foamers (and bottles) purchased from here and they are not foaming... why? What can I do to get them to foam? It spits out the soap as it is... in it's regular form." 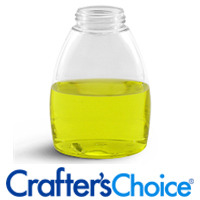 Staff Answer Most soap bases must be diluted at least 50/50 with water to be compatible with these foamer tops. The bottles also must not be filled to the very top. If the foaming chamber is completely covered then it will spit liquid soap out instead of dispensing thick foam. Please call customer service if you need any further assistance. I have these...they are 4 inches from the bottom of the pump to the end of the tube. Hope that helps! "DO these pumps fit any other bottle than the 8.5 oz. Table Top?"